Kareem (real life Palestinian hip-hop artist Tamer Nafar) is a young Palestinian from an Arab ghetto outside Tel Aviv who aspires to become the first Arab-Israeli rapper. For Kareem, his buddies and girlfriend Manar, music verbalizes their lives. "My songs aren't political, they just describe the place I come from. "But politics are embedded in their everyday existence in a crime-ridden, conservative community where gender expectations, police brutality, government prohibitions, and family are inescapable. Udi Aloni is an Israeli and American director and writer whose work frequently explores the interrelationships between art, theory and activism. His films have been presented in the Berlinale and other major film festivals. His past awards include the Berlinale's CINEMA Fairbindet Prize. Aloni's visual art has been presented in leading museums and galleries, including the Metropolitan in New York and the Israel Museum in Jerusalem. His most recent book is "What Does a Jew Want? : On Binationalism and Other Specters" (Columbia University Press, 2011). His recent stage work was "Anti-Oedipus" at the Schillertag Mannheim 2015. Aloni has mentored young actors from one of the harshest refugee camps in Palestine, helping them reach the world stage. 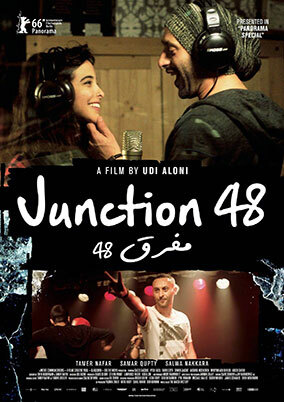 JUNCTION 48 (2016) by Udi Aloni [excerpt] from Richard Lormand on Vimeo.